Figure 1: Cornus sericea (Photo by Sally and Andy Wasowski). The term native plant is fluid and can have many different meanings. In general, native plants are species that were present at the beginning of the European settlement of North America. These plants , over time, have evolved to grow in a specific region. Native plants have established complex relationships with other native plants, insects and animals, some of which are dependent on one another to thrive. Generally, native plants naturally occur within a radius of 100 miles of your area and many can do well with a minimum of care once established. Native plants have evolved to thrive in a specific region, and within specific ecosystems. These plants, when situated in the proper environment, support their ecosystems more diversely than exotic plantings. While many homeowners have incorporated flowering plants in their landscapes to attract certain birds and butterflies, the habitat needed to support insect life is greatly needed. Exotic plants may offer a nectar source for wildlife, but in many cases their leaves, fruits, pollen and nectar are not the preferred food of our vital native insects and wildlife. The lack of proper habitat and food sources for native birds and insects is one factor in the decline of many of these species in the United States. The reliance on standard exotic landscape plants leads to predictable landscapes regardless of the region. This creates a loss of regional aesthetic identity. Homeowners who desire for pristine landscapes have created residential properties devoid of leaf and plant litter. With proper planning you can maintain a more natural landscape using native plants, saving money on fertilizers and achieving a lower maintenance landscape. When considering the use of native plants in your residential garden, it is necessary to identify your landscape goals and to assess conditions in your landscape to guide your selection of the most appropriate native plants for your property. 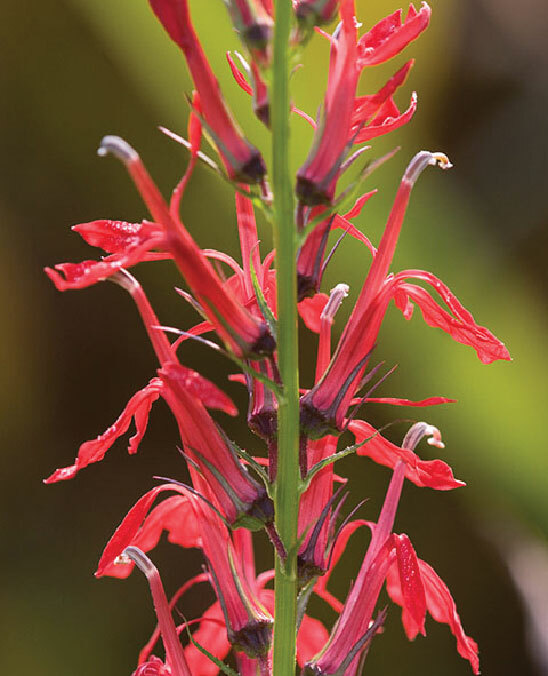 Figure 2: Lobelia cardinalis (Photo by Henry Domke). Reduce maintenance and use of fertilizers and pesticides. Incorporate native plants by replacing plants that are not doing well; adding natives to an existing landscape; or systematically replacing exotic plants with natives. Transition the landscape to reflect the native plants of my region. Provide habitat for certain native species to successfully reproduce. Provide a food source for native wildlife and insects. Determine the desired length of time to transition your landscape to native plants. Inventory what plants, native or exotic, you already have on your property. Set a goal of the number or percentage of natives you want in your landscape, and identify the exotic plants you want to replace. Take into consideration any special uses you would like to highlight in the plant such as producing food for you and/or wildlife, seasonal color and textures, fragrance, etc. Know the growth habit of the plants, including their mature size, rate of growth, and ability to spread or stay where planted in the landscape. Strive for a mixture of plants that provide continuous color in the garden, thereby offering more nectar and pollen sources, resulting in a more sustainable landscape. 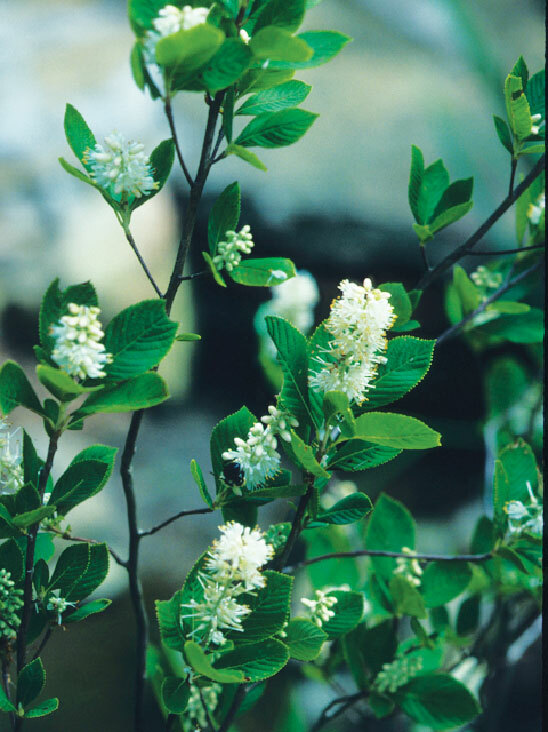 Figure 3: Clethra alnifolia (Photo by Sally and Andy Wasowski). There are three elements to successful planting that you must consider for each specific space on your property. These individual assessments are necessary since conditions can vary on your property depending on the location. Is the soil mostly sand, silt or clay textured? Wet, or well drained? Is the soil acidic, neutral or alkaline? If you don't know, contact your county Cooperative Extension office for a soil test for a minimal fee. What amount of sun light is available throughout the day? Full sun equals 6+ hours of direct sunlight, part sun equals 4 to 6 hours of direct sunlight, part shade equals 2 to 4 hours of direct sunlight and shade equals less than 2 hours of direct sunlight. How much water is available by natural means? You must be willing to commit to watering any new plants when there's inadequate rainfall to get them established the first year. Now the fun part begins by identifying what native plants you'd like for your landscape. Table 1 identifies native plants that tend to be more readily available through local nurseries and plant catalogs. Keep in mind that your native plants, if situated properly, will grow readily so consider buying smaller sized plants. Smaller sized plants also adapt better to their new locations and often catch up in size to larger sized plants within a few years. It is important to emphasize that you should not acquire native plants from the wild. Purchase your plants from a reputable dealer using plant species native to your area. If you're having trouble finding any of these plants, you can either ask your local nursery if they can order it for you, or check out one of the website links provided. American Elm Ulmus americana 'Princeton' Average Full sun 100 ft., rapid New cultivar resistant to Dutch Elm disease. American Holly Ilex opaca Average Full sun-pt. shade 30 ft, slow Evergreen. Need male & female for red berries. American Hornbeam Carpinus caroliniana Average-moist Full sun-pt. shade 30 ft., slow Can't tolerate drought, nice small shade tree. Bald Cypress Taxodium distichum Dry-moist Full sun 100 ft., rapid Thrives in wet or dry soils, conifer sheds needles in fall. Eastern Red Cedar Juniperus virginiana Average Sun-pt. shade 40–60 Ft, slow Evergreen. Resistant to drought. Eastern Red Oak Quercus rubra Average-moist Full sun-pt. shade 80 ft., moderate Tolerates pollution, fall foliage. Eastern Redbud Cercis canadensis Average Sun-pt. shade 30 ft., moderate Magenta flowers in early spring; drought resistant. Eastern White Pine Pinus strobus Average Sun-pt. shade 100 Ft, rapid Evergreen. Flowering dogwood Cornus florida Average Pt. Sun-shade 30 Ft., moderate White flowers in spring; fall foliage. Pawpaw Asimina triloba Average Sun-pt. shade 25 ft., slow Flavorful, edible fruit in fall; need two for pollination. Pin Oak Quercus palustris Acid, avg-moist Full sun-pt. sun 70–90 ft., rapid Easy keeper, roots won't buckle paving; produces acorns. Red Maple Acer rubrum Dry-moist Sun-pt. shade 40–60 ft., rapid Red fall foliage, easy keeper. River Birch Betula nigra Average-moist Full sun-pt. 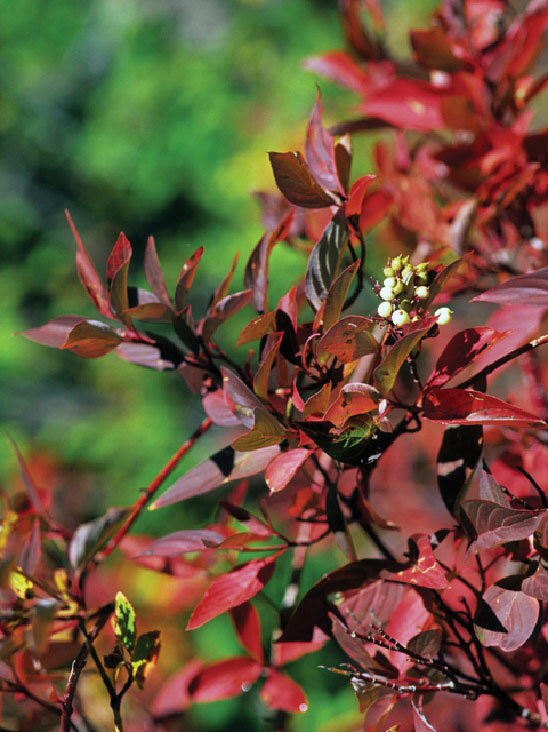 sun 40–60 ft., rapid Peeling bark adds interest, does well in soggy areas. Sugar Maple Acer saccharum Average-moist Sun-pt. shade 60–70 ft., slow Good shade tree, bright fall foliage. Bearberry Arctostaphylos uva-ursi Dry - average Sun-shade 6–12" Evergreen low growing shrub, red berries. Highbush blueberry Vaccinium corymbosum Acid, moist Full sun-pt. shade 6–12' Excellent fall color, edible fruit. Hollyleaved Barberry Mahonia aquifolium Average Sun-pt. shade 8 ft., moderate Evergreen. Drought tolerant. Inkberry Holly Ilex glabra Acid, moist Full sun-pt. shade 4–8' Evergreen, small black berries. Mountain Laurel Kalmia latifolia Acid, avg-moist Part Sun-shade 7–15 ft., slow Evergreen. White flowers in spring. Mulch well. Northern Bayberry Morella pensylvanica Dry - moist Full sun-pt. shade 5–8 ft., rapid Tough plant thrives in all soil types. Northern Spicebush Lindera benzoin Average-moist Full sun-pt. sun 12 ft., slow White or yellow flowers in spring, yellow foliage in fall. Pasture rose Rosa carolina Dry - average Sun-shade 6–12" Fragrant 2" wide pink flowers. Red Chokeberry Aronia arbutifolia Dry - moist Part sun-pt. shade 6–10' Beautiful fall foliage, red fruits. Redstem Dogwood Cornus sericea Average-moist Full sun 12 ft., moderate Has bright red stems if pruned in fall. Fall foliage. Serviceberry Amelanchier alnifolia Average-moist Sun-pt. shade 8–12 ft., moderate Tasty edible fruit in early summer; easy keeper. Southern Arrow-wood Viburnum dentatum Acid, average Sun-pt. shade 3–8 ft., slow White flowers in spring, fall fruit for birds. Summersweet Clethra alnifolia Acid, moist Full sun-pt. shade 5–8' Late summer flowers. Virginia sweetspire Itea virginica Moist - average Full sun-pt shade 3–6' Long lasting fall color. Winterberry Ilex verticillata Acid, avg-moist Full sun-pt. sun 6–10 ft., moderate Evergreen. Need male & female for red berries. Black Eyed Susan Rudbeckia hirta Average Full sun 1–2 ft. Yellow or orange flowers all summer. Boneset Eupatorium perfoliatum Average-moist Full sun-shade 3–6' Flat topped flower clusters that bloom from spring to fall. Bunchberry Dogwood Cornus canadensis Acid, average Part sun-shade 3–6 inches, slow Groundcover. White flowers in spring, red berries in fall. 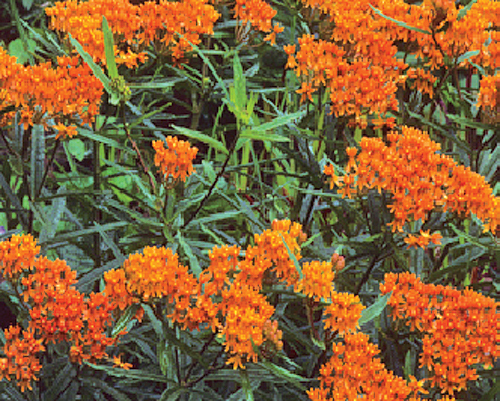 Butterfly Weed Asclepias tuberosa Dry-average Full sun 2 ft. Orange summer blooms, host to monarch caterpillars. Cardinal Flower Lobelia cardinalis Average-moist Part sun-pt. shade 3 ft. Red flowers in summer, attracts hummingbirds. Christmas Fern Polystichum acrostichoides Dry-average Part sun-shade Small fern. Dense Blazing Star Liatris spicata Average Full sun-pt. sun 1–3 ft. Purple spiked flower in summer. 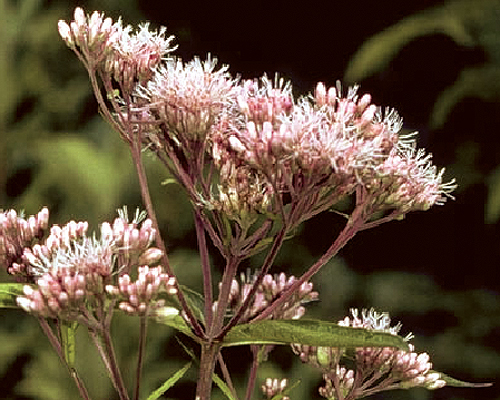 Eastern Joe Pye Weed Eupatorium dubium Moist Sun-pt. shade 3–4 ft. Purple flowers in summer, attracts butterflies & birds. Eastern teaberry Gaultheria procumbens Acid, average Part sun-shade 3–6 inches, moderate Evergreen groundcover. White flowers in spring, fragrant. False Sunflower Heliopsis helianthoides Dry-moist Full sun 3–5' Long blooming, from June to September. Foam flower Tiarella cordifolia Average-moist Pt. shade-shade 1.5–2' Soft flowers on a spike from the center of the plant. Golden tickseed Coreposis tinctoria Average-moist Sun-pt. sun 1–3 ft. Yellow tiny daisy-like flowers all summer; can be invasive. Great Blue Lobelia Lobelia siphilitica Moist -wet Full sun-pt. shade 3 ft. Beautiful blue flowers, attracts butterflies. Grey Goldenrod Solidago nemoralis Dry, poor Full sun-pt. shade 2' tall Showy yellow plumes ideal for dry garden sites. New England Aster Aster novae-angliae Dry - average Sun-pt. shade 2–6 ft. Purple flowers late summer. Attracts bees & butterflies. Pink Tickseed Coreopsis rosea Acid, avg-moist Full sun-pt. shade 18–24 inches Pink daisy-like summer blooms; can be invasive. Purple Coneflower Echinacea purpurea Average Full sun 2 ft. Purple summer blooms, goldfinches love its seeds! Royal Fern Osmunda regalis Average-moist Shade 6 ft., moderate Beautiful large fern, has fall color. Trumpet Honeysuckle Lonicera sempervirens Average-moist Full sun-pt. sun 10–20 ft., rapid Climbing vine with red or orange blooms in summer. 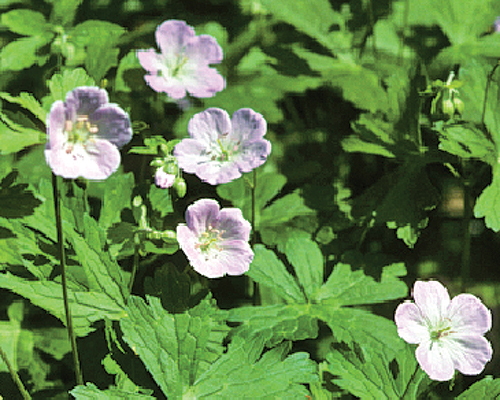 Wild geranium Geranium maculatum Average Full sun-pt. shade 2' Low growing mounding plant that spreads easily. Field Guide to Wildflowers of North America, D.M. Brandenburg, 2010, Sterling Press. Armitages Native Plants for North American Gardens, A.A. Arimitage, 2006, Timber Press. Bringing Nature Home, Douglas Tallamy, 2009, Timber Press. Plant Communities of New Jersey, K.H. Anderson and B.R. Collins, 1994, Rutgers Press. Native Plants of the North East, Donald J. Leopold, 2005, Timber Press.